The director of a documentary on fracking has withdrawn from a conference hosted by the International Monetary Fund (IMF) and Oxford University after organizers refused to screen a clip from his film that was critical of Russia. 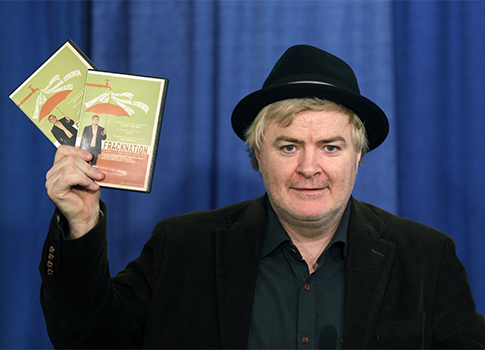 Phelim McAleer, the co-director of FrackNation, was scheduled to screen clips from his film at a conference on international commodity prices being held Wednesday and Thursday at IMF headquarters in Washington, D.C. However, organizers informed McAleer that one of the clips concerning Russia’s manipulation of Eastern Europe’s gas supply would not be shown. McAleer withdrew from the conference as a result and told the Washington Free Beacon that IMF’s decision is "an attack on journalism and an attack on free speech." "It's actually unbelievable that a conference by IMF and Oxford would want to censor one of their speakers to protect one of the wealthiest countries in the world," McAleer said. "Do people really want to go to a conference where opinions on powerful people are censored?" In an email chain provided to the Free Beacon, IMF senior economist Rabah Arezki wrote that the clip could not be shown to the conference because there would be no balancing commentary. "We are thrilled that Phelim will come and address us soon and we expect a large audience," Arezki wrote. "But as an international institution we cannot show the video clip on Russia and Poland (item 4) without allowing others to have their say on the matter. Since that isn't possible on this occasion, Phelim will have to skip that. The other clips are fine and we look forward to Phelim's talk." The clip in question contains interviews with British journalist James Delingpole and Neil Buckley, the Eastern European editor of the Financial Times. McAleer and several interviewees argue that expanding shale gas production in Poland could free the country from dependence on Russia. "The problem with relying on Russia for gas is that Russia now has a proven history of using gas as a kind of tool or rather blunt instrument of diplomacy," Buckley says in the clip. Russia shut off or throttled natural gas supplies to Ukraine several times over the past decade, leaving millions of Eastern Europeans without heat. Many foreign policy experts say Russia uses its gas supply as a geopolitical cudgel against the European Union. "I would say Russia is screwed if it can’t export its gas, so it really is very important to Russia that the shale gas revolution does not happen," Delingpole says. "It is also in Russia’s interest to fund those environmental groups which are committed to campaigning against fracking." Buckley also relates a story about attending a dinner with then-Prime Minister of Russia Vladimir Putin, where journalists and academics were invited to ask questions. "The final question was about gas, and particularly about shale gas," Buckley says. "It was very interesting to see [Putin’s] reaction and a real illustration, I think, of the concern that shale gas is causing in Russia. Because it was one of the few moments in the dinner where Putin really became quite engaged almost agitated." "He said if you look at photographs from a helicopter or plane over where this has been done in the U.S., you can see the damage," Buckley continues. "He essentially said when people in Europe understand the implications of this technology and what it does to the environment then they are not going to want to do it. Therefore it is not going to be a threat to us." In the clips, McAleer also interviews a Polish pensioner who spends nearly all of her income on gas bills from Russian state-owned energy giant Gazprom. The IMF and Oxford University did not immediately return requests for comment. This entry was posted in National Security and tagged Climate Change, Fracking, Media, Russia. Bookmark the permalink.